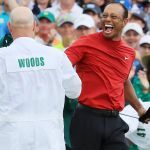 Tiger Woods is back inside the world’s top 10 for the first time since July 2014 following his sensational Masters victory. The 43-year-old’s one-shot win at Augusta propelled him to six in the world – his highest ranking since falling to a career-low 1,199 in 2017. Justin Thomas, who finished tied 12th in the year’s first major, remains world No 5, but he now has Woods breathing down his neck.